I recently watched some episodes of the television series Northern Exposure with a group of friends, a couple of whom had never seen the show. We watched four episodes: the first two as introductions to the characters, and then two of my top picks from the series, Burning Down the House and Cicely. I was a huge fan of this show when it was on, and in my memory it still ranks very high on my list of all-time favorite television. I’m happy to say that, for me at least, it holds up. The newbies became instant fans as well. I believe that it was a seminal and transformative show, one of many that helped shape what serial television has become. Northern Exposure was always thought provoking. Watching it now, twenty-five years since it premiered, it’s still provoking me to think. What follows here are just some random ideas that popped up while ruminating on the show, these episodes, and my love of it. Burning Down the House is arguably the most famous and well-known episode. In it the character of Chris Stevens (portrayed by John Corbett), the town DJ, philosopher and artist, wants to create a work of art, a performance piece, what he refers to as a pure moment. He builds a trebuchet (a type of catapult), with which he plans to fling a cow. When he discovers that this had already been done in the movie Monty Python and the Holy Grail he was despondent. His idea had already been done. The cow had been flung. Ironically it was Maurice (portrayed by Barry Corbin), the town millionaire and the person there with the least interest in or understanding of art, who talked Chris into pursuing his vision. Without context that doesn’t make a whole lot of sense, but she was completely right. What’s more, Maurice is totally Mr. Spook in the this scene. 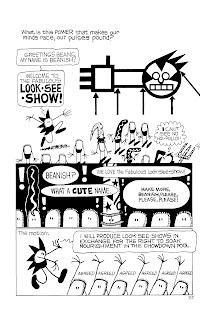 The context I’m speaking of is the wonderful comic book series Tales of the Beanworld by Larry Marder. I’ve written about it at length HERE, so I’m not going to go into all of the details again, but here’s the context. Beanish is the artist of his community. He creates pieces of art that he calls ‟The Fabulous Look See Show!” He builds art installations and then shares them with everyone. The scene in the above clip could have been taken straight from the comic. To further the analogy, Maurice takes on the role of Mr. Spook. 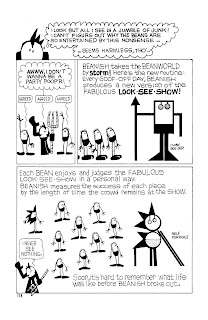 In the Beanworld Mr. Spook is the protector of the community. 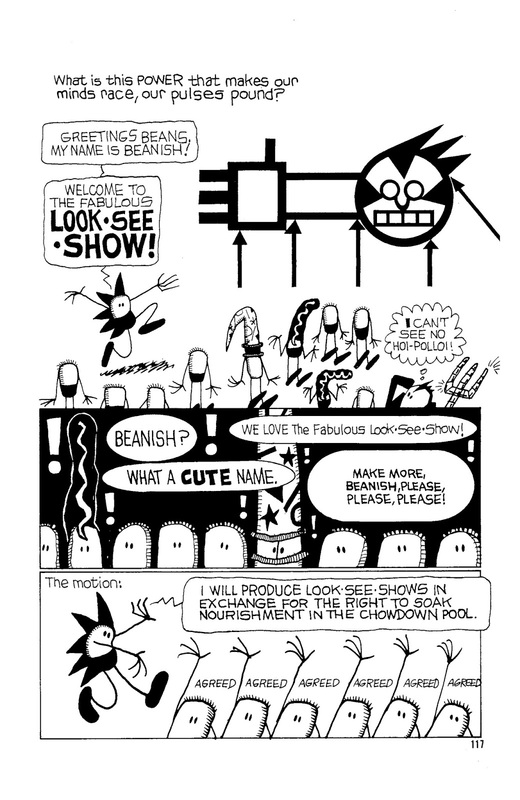 He is not very imaginative and he alone of all the Beans, simply cannot see Beanish’s art. Though he never discourages Beanish from doing it, Mr. Spook cannot comprehend what art is for or about. Watch Maurice’s reaction at the 0:44 mark in the video and compare it to this scene. I don’t really have any grand insights into this, I was just struck by the similarity between two pretty disparate things I love. I do think both capture the feelings of artists everywhere. Here’s this fabulous thing I did! Look! See! I’m trying to say something profound about the world we live in, and I don’t know if I’ve been successful or not but I want to share it!” I think it also, gently, captures the experience of those who ‟don’t get it.” Maurice and Mr. Spook stand outside the artistic experience, but in these fictional communities they do not hinder the artist, nor are they ostracized by the artistic community. There is acceptance of both points of view. Which leads to another similarity between Cicely, Alaska and the Beanworld; they are, in many ways, idyllic communities. I won’t go so far as to say Utopian because that implies perfection and a lack of conflict. 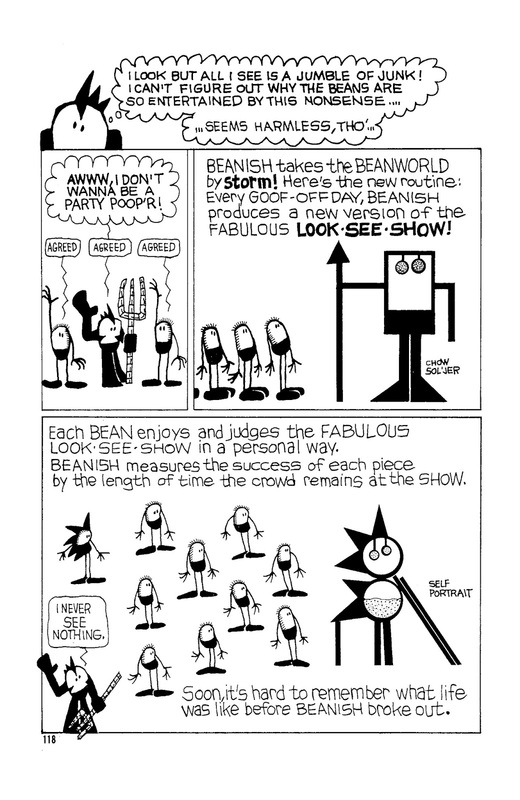 There are conflicts galore in both Northern Exposure and Beanworld, but they typically do not include the same type of story engines that most of our genre fictions employ. But they are places you would like to live. Cicely, specifically. I think part of the success of the show (and there are many factors), is that it was a story of a community, one we would all like to be a part of. For me it reflects the ideas of diversity, of people and ideas, of ways of living. It’s about finding your place and needing to be accepted in your chosen community for who you are. That’s something I believe everyone craves for themselves, even those who are opposed to the same idea for others. Even those who can’t accept other points of view want to be accepted. We all want to find our home. There’s no place like it, or so I hear. But strangely, our fictions don’t often address this. We seem geared to narratives based on conflict between competing points of view. The most popular entertainment these days seems to be the dystopian. A friend of mine recently shared the following quote on Tumblr, within a day or so of my first musings about the semi-Utopian nature of Cicely. This really struck me. I don’t know that there is any type of conspiracy in media to make this so, but I do think it’s an accurate depiction. What does it say about us that we can’t imagine a future that is positive? I’m certainly guilty of this in my media consumption. I’m a fan of The Walking Dead, both the comic and the TV show. I loved Stephen King’s The Stand. Mad Max: Fury Road was the surprise hit of the summer for me. I’m not alone in any of these. None of these represent a future I want to live through. I don’t think anyone really does. The point can be made that these, and other post-apocalyptic fictions, are about the triumph of the human spirit in the midst of terrible catastrophe. Still, they seem to say that we can only expect terrible catastrophe in our future. Referring to Maslow’s famous Hierarchy, there’s not a lot of room for art and self actualization when mere survival is at stake, a situation far too many people in the real world find themselves in daily without the threat of Zombies or irradiated mutants. Odd then that our fictions often present a world where there would be no opportunity for fictions to exist (though maybe visions of a Utopian future would thrive in a wasteland). The early days of Science Fiction, and I’m speaking in general terms here because there are always exceptions, regularly portrayed the future as a positive thing. Technology was going to save us from drudgery. Flying cars and teleportation and the elimination of death and disease were recurring themes. But somewhere our relationship with technology changed. It brought us cars and TV and medical advances but it also brought us the Atomic Bomb. Suddenly the possibility of mass destruction was a reality instead of a fiction. So our fictions changed to make our fears manifest, and fear is always more palpable than hope (which explains a lot of our politics, but that’s a separate blog I’ll probably never write). Star Trek is one of the hopeful SciFi futures that has endured. It predicts a world where science has solved the world’s problems and people live in a diverse, multicultural society where actual progress thrives. The original Enterprise, and to varying extents the all of the subsequent settings, was a community where you wanted to live. There was the same sense of belonging and acceptance there that we see in Northern Exposure. They are communities where you are valued for who you are, not discriminated against because of who you are. It’s not just Science Fiction and visions of the future. To come back to television a lot of the most popular shows carry an element of the Dystopian Present. Looking at examples of things I watched and thoroughly enjoyed I can see the pattern. The motorcycle club of Sons of Anarchy was a community, but certainly not one I would want to belong to. For all of their ideals of the freedom of the road and freedom from societal norms, the rules of belonging to their community were incredibly limiting and stepping outside of those rules could have fatal consequences. 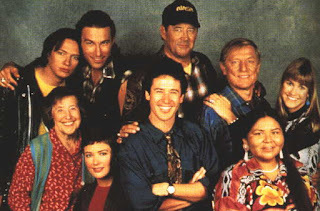 The cast of Northern Exposure, all alive at the end of the series. The cast of Sons of Anarchy. 8 of these 10 characters died. There was a patina of brotherhood that covered them, and as a viewer I could respond to these bonds on a visceral level. But time and again one of these ‟brothers” would have to be eliminated ‟for the good” of the club. There was no real acceptance of differences or diversity. There was a pretty strict party line that had to be followed. There was no room for true individuality. Which holds true for a lot of subcultures that claim to be about individuality. So what am I saying with this rambling set of connections? I’m not exactly sure. The image of the artist and those who don’t understand him can be seen as metaphor for anyone who simply wants to be seen and heard by his community. It’s something everyone can relate to, whether they are an ‟artist” or not. Maurice and Mr. Spook want their places in their community to be respected as much as Chris and Beanish do. ‟This is the answer, right here. Destruction and creation. The scarred battlefield of life. From the ashes rises the Phoenix! From the skin rises a new snake! Just thought I’d fling this out there.